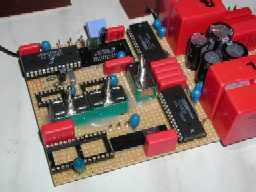 The PCB with the Receiver, Digital Filter and DAC Stage. Clearly to see are the switches for making combinations. Clearly painted are the two optical TOS-LINK receivers (347kB download)and the coax cinch input with pulse transformer. This data is AC coupled linked to the input of the receiver CS8412 (643kB download). The 8412 is a well know simple straight forward receiver in Hardware mode. Internally, the system clock is regenerated with a phase locked loop (PLL). This ensures an almost jitterfree clock for the digital filter and DAC chip, thus minimizing the effect of the data-transmission link (I even use a 10m optical fiber cable without any problems!!). Data This is left and right data in Left/Right sequence, where each "word" uses 32 bits length, even though the data is 16 bit long. This is done to keep the standard open for 20, 24 bits and ...... The Data is in RIGHT JUSTIFIED MSB first. There are more modes in the digital data world, but this one is the most commonly used for Audio equipment. The digital filter is doing many things with the original signal, like calculating interpolating "new" samples. The oversampling runs at 8 times, Therefore the Filtering of the sample frequency components after the DAC later on can be much simpler. In stead of a BRICKWALL filter you can use simple 6dB linear filters. The digital filter also filters in the digital domain already all frequencies above the audioband as with the interpolation all kinds of "new" frequency products see the light. It may be clear that the quality of the filtering algorithms and speed of the digital filter is critical for the final result. The NPC chip SM5842 is a top of the range filter with studio quality. For those wanting more details, have a look at the datasheet of the SM5842AP.... (201kB download). The 5842 need to be set up for the right number of bits at the input (16 or 24 bits) and output bits (20 for the PCM63). This is done with the switchbank. Of course you can choose fix connections to V+ or GND (as proposed in the version 2.0). Furthermore there is an option to chose jitter free clocking and Low level signal dithering. To be honest, I could not really tell the difference when listening to it.... But may be you can. DOL Data Output Left This is left channel data where each "word" uses 32 bits length with 20 information. The Data is in RIGHT JUSTIFIED MSB first. DOR Data Output Right This is right channel data where each "word" uses 32 bits length with 20 information. The Data is in RIGHT JUSTIFIED MSB first. System Clock The final system clock runs at 256 x Fs, controlling the serial clocking into the DAC of the 2 channels in parallel (!). These 4 signals goes to the final DAC chip stage for the Digital to analog conversion. Basically you see that the whole setup of a DAC is more of less modular with standard interfacing signals. This makes experimenting and upgrading much easier.